Here is a bit of out-of-the-box thinking for you. What we do at ICG is consult e-commerce businesses and help them use the latest tools and technology to improve their online sales. This article will show you how to easily split test your offline promotions and see which ones drive more online sales. Let’s say you’re printing offline catalog that you’ll be sending to your leads. How about designing two different versions of the catalog to see which one converts best? It’s just like with online conversion rate optimization, small changes could mean a significant increase in conversion rate. The problem is – measurement and tracking. How do we know which one performed better? Let’s say you designed catalog version A and B and delivered equal amount of each version to your leads and that you have a statistically significant amount of leads to run a conversion rate optimization test. You could include two different QR codes. One could land on example.com/VersionALandingPage and the other on example.com/VersionBLandingPage. From here you could easily track how many of them took the action of visiting the website after reading the catalog, indicating micro conversion, and you can track them down the funnel and see how many of them completed the checkout and compare the macro conversion rate of catalog version A and version B. Although it sounds like a great idea, and maybe one day in the near future it will be, nowadays the use of QR codes is not that popular. This means that a significant amount of your visitors that found you through the catalog will visit your website by directly typing the domain into browser or into Google. We can’t track from which version of catalog they came. We could survey them on checkout, but that would just annoy them and lower our conversion rate, which is actually the opposite of what we’re trying to achieve here. So how do we fix the measurement problem? Lets say you’re giving a 10% discount to customers that buy your products in December using a code for example “December10”. 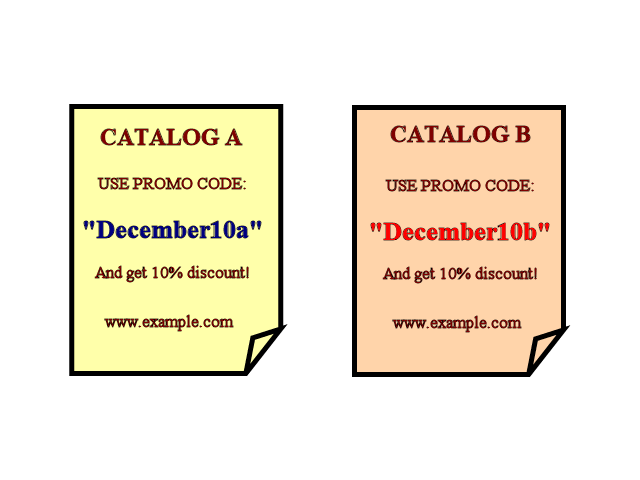 Lets include different promo codes in catalog version A and version B. So the A would have a promo code “December10a” and B would have “December10b”. Now we’re on to something. If a visitor uses that promo code, no matter where visitor came from (direct traffic, Google, Twitter, Facebook), if you printed that promo code only on the offline catalog, you know that that’s what brought him here and either made a conversion or assisted in conversion process. There you go, measurement problem fixed. Have fun with optimizing your offline ads for online conversions!